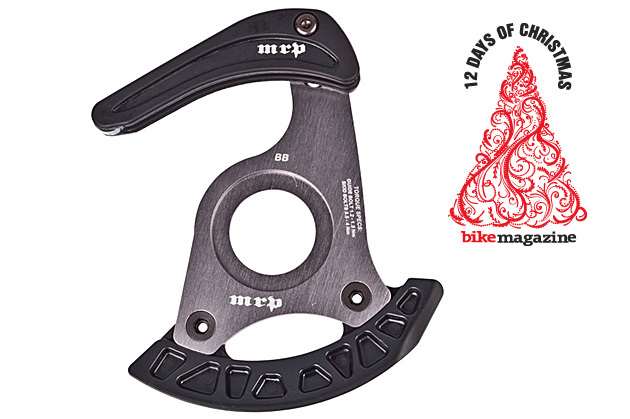 MRP’s All Mountain Guide is perfect for folks who ride single-ring drivetrains (think XX1, X01, etc.) and are wanting a bit of chainring protection. It’s available in ISCG-05, ISCG and bottom bracket-mount (shown here) versions. Let's say you're running (or thinking of switching to) a single chainring up front. Maybe you're going to spring for a complete SRAM XX1 or X01 group. Maybe you're simply manning up and just making that 36-tooth rear cog really work for you. Either way, you probably need some kind of chainring protection, particularly if you live somewhere with tons of downed trees or plenty of big rocks. Large, immovable things embedded in the trail have a way of ruining expensive chainrings. What to do? Get MRP's All-Mountain Guide (AMg), which is designed to be run in tandem with 1×10 and 1×11 drivetrains. The guide features MRP's integrated taco-style skid and an upper guide, which is kind of overkill for either SRAM XX1 or X01, but is the bees knees for less secure set ups. If you like bikes with low bottom brackets, that skid plate is going to come in real handy. The whole thing weighs in at just 120 grams. MRP's guide is available in ISCG, ISCG-05 and bottom bracket-mount (shown here) versions. I opted for the ISCG-05 version this spring and have been a happy camper ever since. So happy, in fact, that I just forked over my credit card digits for another one. That kind of happy. For more information on MRP’s AMg CLICK HERE.